Blue Star Mothers H.O.M.E. 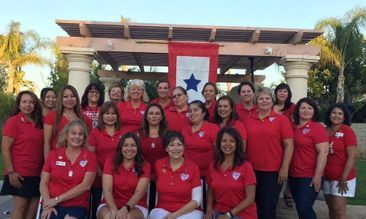 is a chapter of Blue Star Mothers of America, Inc. and proudly serves the military families. We are mothers who now have, or have had children honorably serving in the military. We are a non-profit 501(c)(3) service organization supporting each other and our children while promoting patriotism. Membership is open to any mother currently living in the US and who has a son or daughter in the military or an honorably discharged Veteran. Associate members and Blue Star Dads are welcome to join us as well and there is no membership fee for these categories. To become a member, please visit our National website at www.BlueStarMothers.org. We meet the second Monday of every month. Easy freeway access. 15 freeway, the first exit south of the 91 Freeway, Magnolia Ave. We are located in the Corona Pointe, Lowe's Shopping Center. Our office is located across the parking lot from Lowe's. We are located in the G AMP building, next to the dentist office. Meeting time 7:00 pm to 7:45 pm. 7:45 - 8:30 PM Caring and Sharing time. Mom's time to share about whatever you want to share. It's a great time to get to know the other mothers and how much we all have in common. This organization is a 501(c)(3) organization. Save your receipt for a tax deduction.